The Morelli pasta production factory is unique. They have a secret ingredient that is not found in other pasta. It’s the heart of the grain itself… wheat germ. Wheat germ contains vitamin A, vitamin D, as well as vegetable protein so it has significant nutritional value. When the wheat goes through the grinding process the wheat germ is removed from the semolina in order to reduce the perish-ability. Thanks to the craftsmanship used at the Morelli Pasta Factory the wheat germ is re-incorporated into the semolina. Hence Morelli’s slogan is “OUR PASTA IS SOMETHING ELSE“. Their pasta has a unique flavor. It releases a wonderful aroma on cooking and the cooking water take on a slight green hue. Morelli was founded in 1860, and is now run by the fifth generation of the Morelli family. Today Lucia, Antonio and Marco run the company preserving its traditions. Morelli uses ancient craft techniques and is free of both preservatives and coloring agents. The result is truly wholesome pasta, with a wonderfully rich flavour and full consistency. 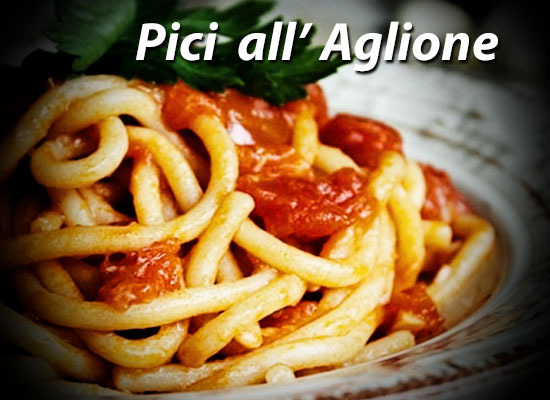 Friends that have been to Tuscany most often know about Pici. It is still quite often “pasta fresca” hand rolled and made fresh when you visit Tuscany. Looks easy enough but we don’t recommend that simply because we just don’t have the Durum Wheat they have in Italy and it is the wheat that gives its aroma and flavor that pairs so well with a variety of sauces. 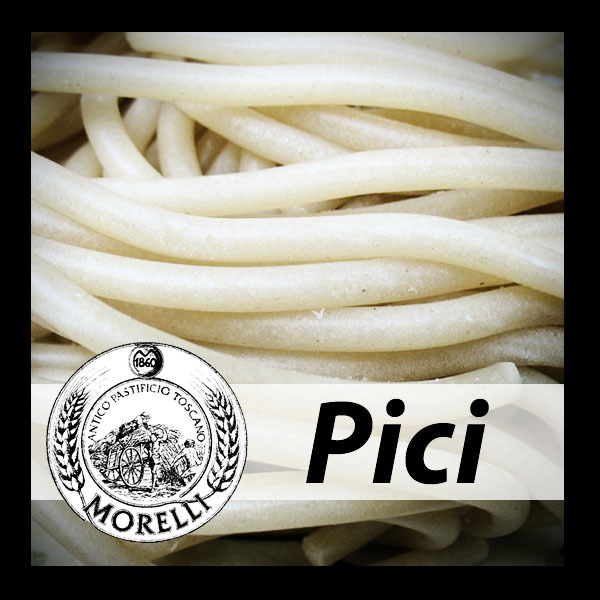 Our truly artisan Morelli Pici a wonderful because it is made from premium ingredients, extruded through bronze dyes and was let to dry over a period of 4 days. In the mean time check out these recipes… They are all very easy but have twice the bread the recipe calls for around in case you burn the bread crumbs. It like nuts… you are running around the kitchen things will and do get out of control, A chef once told me after having burned the nuts for the salad,,, You’re not cooking if you haven’t burned the nuts! 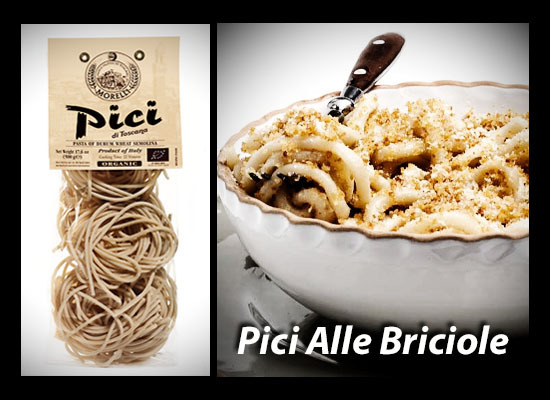 Pici Alle Briciole… Tuscan recipes are simple. To prepare Pici alle briciole you’ll need just two thin slices of day-old or fresh Tuscan bread, extra-virgin olive oil, Bomba pepper paste, 2 cloves of garlic bruised, salt and pepper. While the pasta is cooking (Pici takes 20-25 minutes) run the bread through a food processor to obtain a coarse mixture. Then heat a couple of tablespoons of EVOO in a skillet. When it’s up to temp add the two cloves of garlic and let them sizzle for 2 minutes to season the oil. Then add the bread crumbs and turn them in the oil till they are golden maybe 5 minutes. Turn off the heat add ground black pepper and salt. In a seperate pan season some EVOO with chili flakes or Bomba Chili Paste. Add the cooked pici well drained to the pan with the chili and mix well. Then add the toasted toasted bread crumbs. Serve with plenty of grated pecorino. Click Here To View the Printable Version In this one I do the bread crumbs in the oven. The flavored pasta from Pastificio Morelli are delicious an in some cases just need to be tossed with a little olive oil and perhaps flavored with a little garlic. If you see the squid ink pasta in the store you received this link from try the peasant pasta or the bread crumb and sardine recipe the are really good and nutritious. Aglione Sauce is one of those quick simple sauces that that takes 10-15 minutes to make. It is essentially the classic red sauce with a lot of garlic. Crush tomatoes by hand. Get your sauté pan warm and add in the oil the garlic and the Bomba Sauce and in 4 or 5 minutes when the garlic is golden brown and the oil well seasoned add the tomatoes juice and all to the skillet. Season with salt and pepper and let simmer on med high heat for about 10-15 minutes, stirring occasionally. About 3-4 minutes short of the recommended cook time pull pasta directly from the pot and into the sauce or reserve a couple of cups of Pasta Water then drain and put immediately into the sauce without rinsing. Toss to coat well and add reserved pasta water as necessary till pasta is Al Dente. Serve with grated Pecorino cheese.